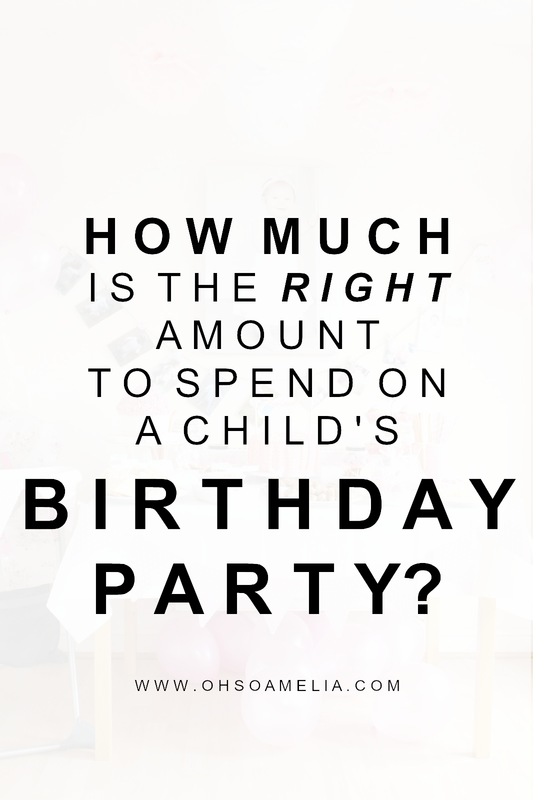 How Much Is The Right Amount To Spend On A Child's Birthday Party? With Harry's first birthday coming up I have been browsing good ol' Pinterest for ideas for his party. I wasn't going to do a party but I thought seeing as we did one for Amelia's first birthday and it's also his first it would be a shame not to throw one for one and not the other. As we don't have many relatives living close by it won't be a big party, more like a small get together with a few family members and friends. Whilst I was browsing Pinterest for party food and table decor ideas it suddenly dawned on me how much a birthday party for a child actually costs! You can view my Pinterest board here of some of my ideas so far. 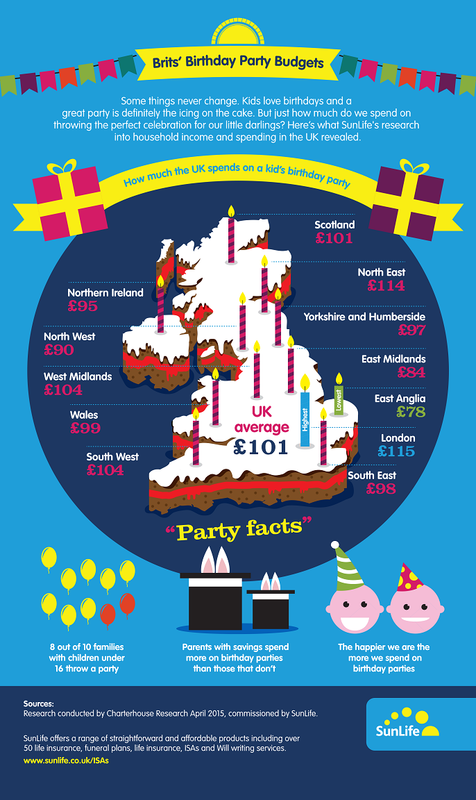 I recently came across the Infographic below created SunLife which shows how much the UK spends on kid's birthday parties. The UK average that parent's spend on their kid's party is just £101 which I think is very reasonable, I was actually shocked that it wasn't higher. I wasn't surprised to see that parent's in London spend the most on their children's birthday parties as their household income tends to be slightly higher. I was shocked to see that Wales was only £99 as I probably spend double that on Amelia's first birthday party. It does make you realise just how much you can spend from party food and decorations to party games and entertainment is all adds up! From these results 8 out of 10 parents throw a party for their child under 16. We didn't have a birthday party for Amelia's 2nd or 3rd birthday and we probably won't for Harry either but I think when she's in reception year we will start doing them when she makes more friends as I'm sure she'll have a lot of parties to go to too. How much did you spend on your child's first birthday? Does it match with your location on the Infographic? Really interesting post with nice informations! Wow £78 for east anglia??!! Most people I know have spent upwards of £300!!! I threw a skating party for £150 for 10 boys earlier in the year. My daughters 5th birthday at home still came in around £100 for 6 girls. You've got food, games and party bags plus they like to take sweets into school for the non party children. 1st birthdays are easy i think I spent much less then as they get older and want specific things. I don't think you can put a price on it but aslong as you arnt bankrupting yourself over it. It is just a party and none of mine remember details from them just what they did with their mates. According to this I am really overspending on my kids! I always find I have always spent more on Cameron compared to Lucas. I think that's down to the fact that Lucas gets all Cameron's old toys so he really doesn't need anything. Is that mean? Cameron has had birthday parties with family, but next year will be the first one I will do for his friends. I am dreading the cost! Very interesting post Kerry. Over the pond here I'd spend easily €200 on a party. This year I done both kids together and managed €258 which was brilliant. Won't be able to pull it off next year though, she wants a pamper party. Mine end up always costing a fortune as we have so many family, but my kids love them, I have tried doing on a budget and a lot of the time I reuse (I have party boxes now) but with 30 and over kids per party I spend alot. Northern Ireland on average spends £95 on their child for their birthday. Is this just presents or party AND presents? Because if its both, that estimation is WAY off, lol! I like to go all out for a party for the kids. Sometimes I bit off more than I can chew, but they have fun at thats the main goal. Wow I always tried to spend less than that but thats because im on a tight budget. i think next year we will be spending a lot as my daughter is 8 and will be having a special religious cermony as well as a party... best get saving! Aaaargh, I will get there! ... More than that. I guess it gets slightly more expensive when they're at school and you try to invite their closest friends as well as whoever has invited them before. Very interesting infographic. Parties can be very expensive and I have seen a few parents spend hundreds of pounds on a lavish party as well as many parents trying to out-do each other. We had a party for Bug this year, his first proper big party with his friends and it was surprising how quickly the cost added up even though we stuck to a tight budget.